New Delhi, April 13: A man in his 60s allegedly committed suicide Saturday by jumping in front of a moving train at the Tilak Nagar station on the Blue Line of the Delhi Metro Rail Corporation (DMRC), police said. 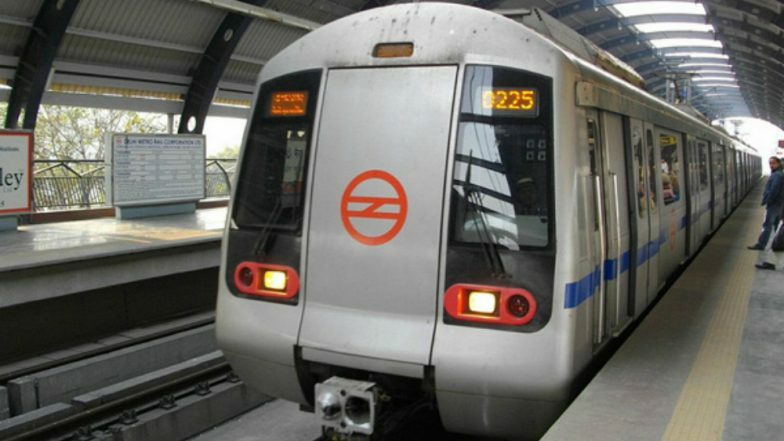 The victim jumped in front of the train headed towards Dwarka around 10:40 am, a DMRC spokesperson said, adding that services were briefly delayed on the Blue Line that connects Dwarka in Delhi to Noida. Delhi Woman Jumps on Track at Dwarka Mor Metro Station to Get Rs 2,000 Note, Escapes With Minor Injuries As Train Runs Over. "An elderly man, about 65, jumped in front of a metro train at Tilak Nagar metro station. He was taken to the Deen Dayal Upadhyay Hospital, where he was declared brought dead," Deputy Commissioner of Police (Metro) Mohammed Ali said. Efforts are underway to ascertain the identity of the deceased, Ali added. On Wednesday, Sita Ram Arora, an elderly resident of Ramesh Nagar, had allegedly committed suicide by jumping in front of a moving train at the Ramesh Nagar metro station on the Blue Line. Prior to that, a 32-year-old businessman was seriously injured after he allegedly attempted suicide by jumping before a moving train at another metro station, officials had said. On April 4, a 46-year-old Delhi Police ASI had also allegedly committed suicide by jumping before a train at the Jahangirpuri metro station on the busy Yellow Line of the DMRC.